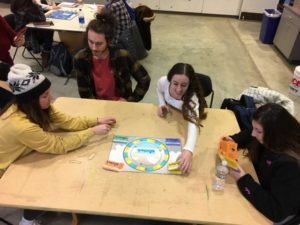 Senior BFA students announced that Session Three of the senior solo shows will take place in the Art and Interactive Multimedia Building side gallery (AIMM 119). Students Abigail Rothman and Lauren Galuppo will be opening their shows on Wednesday, November 14th. ABIGAIL ROTHMAN’s work aims to challenge and critique society, in its political and social manifestations. Utilizing installation, print and drawing, she is attempting to highlight the unacceptable treatment of women by men in power throughout time. The various statements from interviews, text, and Twitter from President Donald Trump as the inspiration for the content, referencing specific examples to express the mistreatment of the female population. This collection of work represents a physical verbal documentation. LAUREN GALUPPO explores and experiments with some of the basics of painting – form, color, and brushwork. The sensuality of her large scale figures, saturated in reds, whites, and blacks, is complimented by the urgency of her brushstrokes, varying in thickness and textures. The paintings explore what it means to be artist and subject at the same time, representing her surrender to the medium and her allowance to be vulnerable both on the canvas and in front of it. Image credits: left: Fake News: Donald Dump, Yuge Mess, Abigail Rothman 2018; right: Cadmium, Lauren Galuppo 2018. All Rights Reserved.